Please follow the steps below, which should only take 10 minutes or less, to log in and update your latest contact information and areas of Emmaus service. If you have any difficulties signing in or updating your information please let us know by clicking the button labeled “Problems?” below the sign in entry fields (preferable) or send an email to the SWVA WebServant. This Database will presently work with Internet Explorer 9. We are working to use other browsers which should be in a future version. If anything does not display properly please notify the SWVA WebServant indicating what browser you are using, the page you are displaying (menu item selected), and a description of the problem you encountered. Click “LOG INTO DATABASE” button above. This will bring you to the IMS Sign In page. If the IMS Sign In page does not come up try closing all copies of the browser and retry. Enter your email address and password into the Email Address and Password entry boxes in the left panel of the IMS Sign In page. Click “Register for Site” button in the left hand panel of the IMS Sign In page. The temporary password is swvaswva. Enter the email address you provided and the temporary password listed above in the Email Address and Password entry boxes in the left panel of the IMS Sign In page. Immediately change your password and update your contact information (see below). Go to “You” → “Change your Sign In Info” and change your password. Click the “Update Your Information” button. 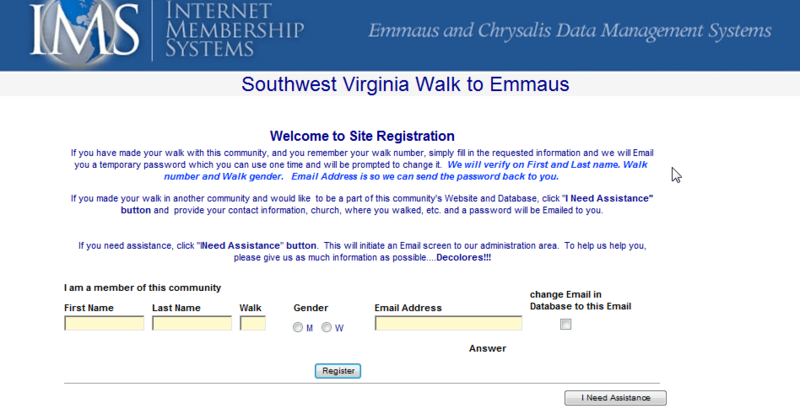 If your walk does not come up email the SWVA web servant. We have added walks for the last 3+ years – back to Walk 127. Other walks will be added later. Put a check mark in the “hide contact information” box. If you have problems accessing or using the database, use the “Problems?” buttons (preferable) located below the sign in entry fields on the home page and on other database pages to report the problem to the administrator, who will contact you if necessary. You can also send an email to the SWVA Web Servant.